Our client had two related cardiovascular products which had been on the market for a number of years. However, despite their positive clinical data, they were struggling for market access and uptake on formularies and therefore patients were not gaining the benefit of having access to these products. To facilitate this, Academy of Managed Care Pharmacy (AMCP) dossiers were required to support reimbursement and/or formulary placement of these products in the USA. Utilised a streamlined process with flexible resource to allow for two robust AMCP dossiers to be developed in parallel and meet the required timelines. Developed these dossiers based on the latest guidelines for formulary submissions in the USA, ensuring that the critical unmet need for these products was outlined clearly, the product benefit outlined, and ultimately the overall value of the two products in the specific patient populations was communicated to the end audience clearly and with impact. We developed two AMCP dossiers in a short timeframe through our flexible approach and due to our detailed and proactive project management of the process. Efficient global collaboration allowed delivery of the projects within a tight schedule, fully utilising the benefits of economies of scale across the projects. 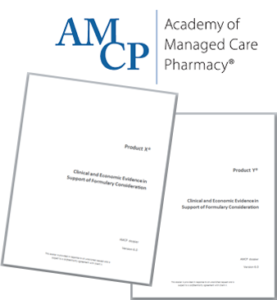 The impactful AMCP dossiers were utilised to secure formulary access for the client’s two products, and the value of developing two AMCP dossiers in parallel allowed not only timeline and process efficiencies but also for appropriate positioning of each of the products to avoid direct competition between the two brands.